Just a quick heads up for you all...the Notebook-Cig by V2 Cigs is currently on sale! The Notebook-Cig allows you to vape without any batteries at all. Just plug it into your notebook, laptop, desktop computer or any USB port and you're good to go! The Notebook-Cig produces thicker, more consistent vapor than most battery-powered e-cigarettes do, and you can use it whenever you're near a USB power source and save your batteries for when you're not. We reviewed the Notebook-Cig back in September and really liked it. You can check out that review here. 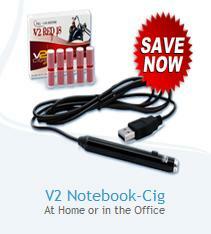 You may also be interested in the V2 Power-Cig, which is another USB-powered e-cigarette from V2 Cigs. The Power-Cig comes with a 7.2 foot (2.2 meter) coiled and stretchable cord, which gives you about 3 feet more distance than the Notebook-Cig's cord does. Lavatube Version 2 Now In Stock! Hooray! V2 Cigs Sale - 10% Off Limited Editions!